In a typical week Kanda Faye ’15 works on a dizzying array of projects. She manages all the hardware in a revolving inventory. You might also find her creating forms, writing policies, developing a program infrastructure, talking with Wellesley staff about simplifying processes, and reaching out to community organizations that might benefit from free technology. In addition to these administrative tasks, Faye performs diagnostics on hardware and software products to be refurbished and then refurbishes them, often also cleaning them up and packaging them for distribution. 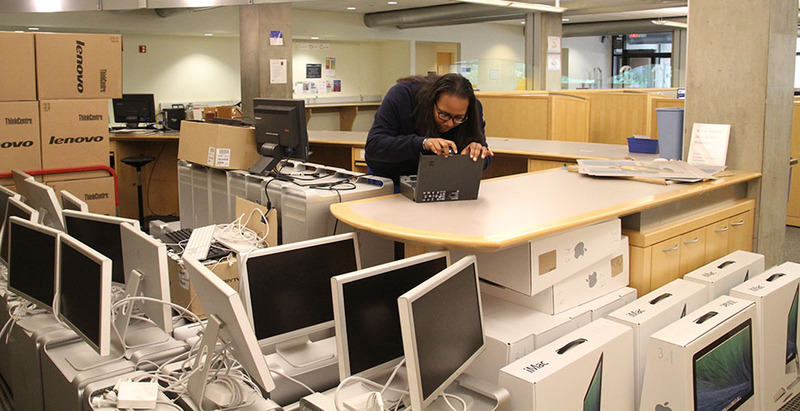 Faye is the coordinator of WISC, or the Wellesley Initiative for Sustainable Computing, a Library & Technology Services (LTS) program that overhauls and repurposes computing equipment that has been retired at the College. Wellesley retires significant numbers of four- to five-year-old computers that, although no longer useful to the College, could be used by students, nonprofit organizations, community centers, and smaller educational institutions. “As coordinator, I am always up and about,” says Faye, “moving between hardware processing and software installation workspaces, my administrative workspace, and everywhere in between.” With help from LTS Manager of Public Services Laura Sherriff, she also evaluates applications from Wellesley individuals and outside nonprofits, and then works with recipients to give them their computers. The WISC program was conceived in 2013 by College Government, LTS, Associate Professor of Environmental Studies Jay Turner, and Wesley Watters, Diana Chapman Walsh Assistant Professor of Astronomy. The Class of 1957 Green Fund provided funds to support the program. Since its inception, WISC has been incorporated into LTS operations and has provided equipment to individuals at Wellesley as well as community centers in the Boston area and schools from Nepal to Uganda. Faye first heard about Wellesley’s sustainable computing program when she was working at the Help Desk. “I became even more interested in the program when I had the opportunity to start volunteering at a youth community organization in Boston last year,” she explains. “Returning to the world of small, nonprofit organizations reminded me that programs like WISC could really make a difference in organizations and community centers that impacts the lives of so many people.” She applied and became the coordinator for the program this summer. Learn more about WISC from the program’s website. Wellesley individuals in need and off-campus community organizations are encouraged to apply for free computers and can access the application form.